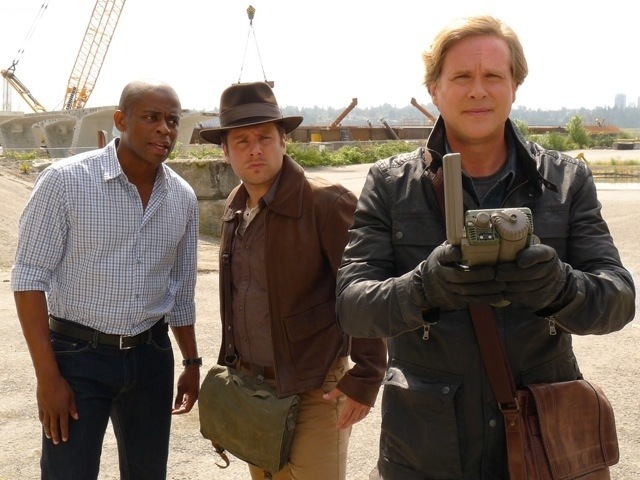 Tonight's "super-sized" mid-season premiere of psych, "Indiana Shawn and the Temple of the Kinda Crappy, Rusty Old Dagger" which actually features Indiana Shawn, sort of a Temple and yes, a kinda crappy old dagger. Despereaux is back! Yup... He returned with all of his classy, clever ways and his topnotch skills to help Shawn and Brutal Hustler... Oh I mean Gus to solve a legend. There were explosion, the bullwhip, an awesome boat chase, secret doors, lines from Back to the future, and a little more than we need to know about Gus' bladder. In the middle of all the fun there were the serious parts too, since the last episode dealt with the boys growing up just a little bi, this time Shawn had to deal with mortality in a way that he had no idea and it's a little more than he can bear, he even went on to deny anything had happened after Despereaux's death, turning away from death just like he did with his lizardie when he was a kid. However, when he finally comes to terms with the truth, he's forced to face reality and realize life is a fun game. Then came the the fight outside of the funeral home between Shawn and Gus, my favourite of their fights, throwing slapped and kicks that resulted the dagger's cap pop out, revealing that the crappy, rusty old dagger was indeed a key to unlocking the legend's safe and allowing them to solve the case with a surprising visit from Despereaux. How about that ending? Sneaky Despereaux still managed to steal himself another painting even though all odds were against him and he thought the painting was crap. I thought the ending was a nice touch with him washing away the covering ink and revealing the true painting just now clever he is. I wonder if Shawn would figure out about the paintings, I guess we'll have to wait and see. I still fancy another Despereux and hope to see him return once again. Bottomline is that tonight's episode was a great comeback for Psych and it marked yet another episode to be a total blast and fun to watch. You can catch Psych on Wednesdays at 10/9C on USAnetwork. What did you thought of the episode? Do you think Despereaux will return and will Shawn find out about the painting? Do let us know by leaving a comment below.